6. We have keys and are in! 7. The move is halfway through ! Gareth Thomas on We are European! rogersarthur on We are European! Alys on We are European! Matilde let out a bray of surprise when she saw her reflection in the mirrored window of Finestrat town hall. 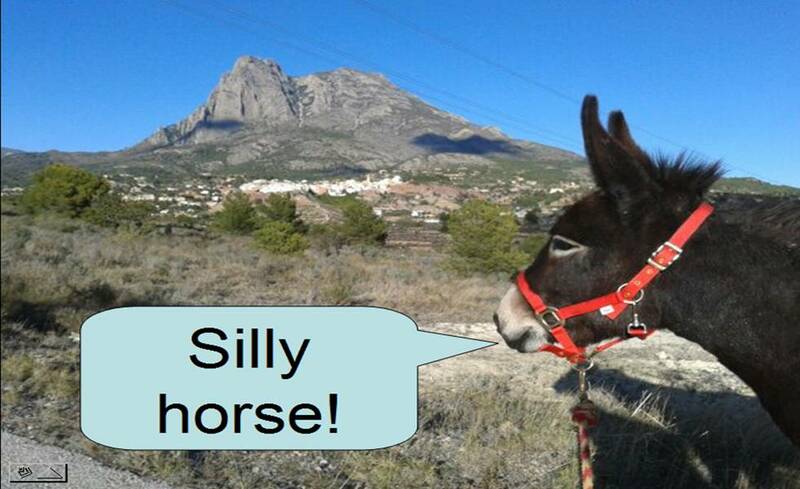 Click on the image to go to a sound file of donkeys braying in turn in a market. There is a great selection of different braying sounds. I bought two donkeys in 2010 and both turned out to be pregnant. I couldn’t risk the foals going somewhere they might not be treated well, so I kept them and ended up with four adults! It was easy supporting them when I was working full-time but I am now retired on a very small pension. Food, regular vet and farrier fees, plus annual Ministry of Agriculture admin costs all add up. Any donations would be gratefully accepted. This is not a registered charity but simply a very low budget private keeper trying to give four donks a good life.